The engineers at Sound Associates have used their extensive knowledge of cinema equipment together with their vast experience of installations and repairs to design and manufacture cutting edge automation systems that tie together servers and sound systems. First used in Sheffield Curzon and recently in Home, Manchester, these systems, which to the untrained eye look as if they are made up of Lego blocks, are having an impact on the way we work at every level. They can either be part of the initial design and installation of a digital cinema system, or they can easily be retro fitted. These plug and play blocks are smaller than their larger, more cumbersome predecessors, but it is the ease of use that is most exciting. Each accessible block enables easier and faster diagnosis of problems but also allows for bespoke requirements to be fulfilled. In addition to the many functions, the automation features a dedicated Fire Alarm input which can automatically mute the sound system, turn off the lamp in the projector and raise the auditorium lights. We are very excited by this evolving system and Senior Engineer, Will Phillips, who builds the units, is keen to emphasise that using them makes onsite wiring faster, and their clear functionality and ease of use help engineers meet installation deadlines. The automation blocks can be used with any system, so far they have been used with Datasat AP20s, Sony, Dolby and Doremi IMS servers. They come with 8 outputs but could be expanded to 12 or even 16. This is a product that can be adapted to suit the specific needs of a cinema, from the initial design stage or added retrospectively. 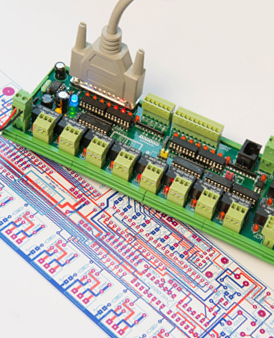 Full schematics are always provided to the client which go hand in hand with instructions written on the board itself.